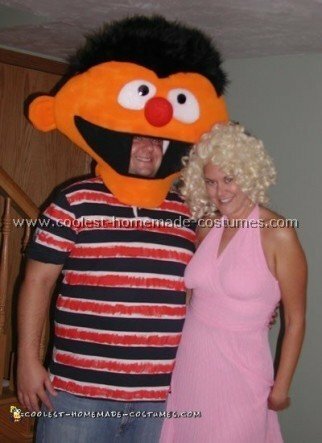 The head of the Ernie costume was made by using foam. I used pictures from the internet to get the basic shape. Ernie’s head is basically a football. I cut that out of foam and made an exact copy for the back piece. I then sewed the head together using a heaving denim thread. This took about two hours. I measured my face hole and centered it in the front side of the foam. I drew on the smile. I just used paint from Wal-Mart. The nose is half a Styrofoam ball. I cut the eyes out Styrofoam as well. I used hot glue and put a screw in it to hold it together. My mom found that awesome fur in a fabric store and we hot glue it on. I had a blue and white stripped shirt and used paint to add the red. I just wore jeans and tennis shoes to complete the costume!